Over the last year, fiction has only had a place by my bedside rather than on my desktop. I still read lots of it (unwittingly some of the time, fake news and all that), but the writing of it… not so much. 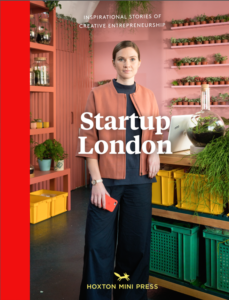 Two very different projects have been absorbing my time, the first of which is a non-fiction book called Startup London for wonder-publishers Hoxton Mini Press. If you frequent fancy furniture shops or hip places, you’ll recognise their beautiful output of collectable photography books – bound in cloth and with stunning imagery often featuring hessian and leather aprons. I could gaze at their books all day – East London Food, Makers of East London, London Coffee. I’m not alone in my fandom as they picked up an Independent Publishers of the Year Award recently. 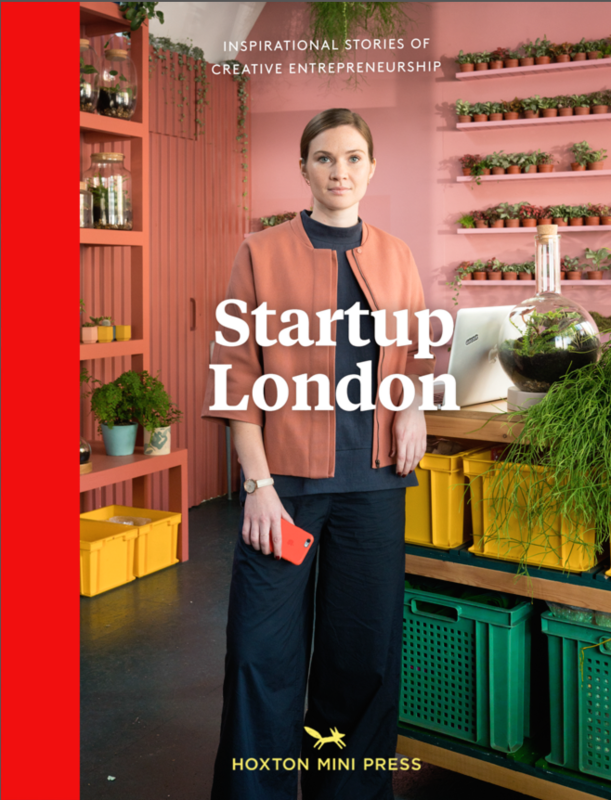 Startup London was a mild departure for both HMP and for me. For them, it was more pan London than the majority of their books with less of an emphasis on the artisan/craft end of business (while still unashamedly looking for the creative and visually interesting). For me, it was about business, an area about which I wouldn’t claim to be an expert. The thinking, which I agree with, is that my features writing and journalism was enough of a qualification because they didn’t want too much about the mechanics of startups, but more about the human stories behind them. The book is a why-not rather than a how-to, inspirational rather than instructional. Although I laboured hard over my words to do justice to the wonderful women and men who I interviewed, the real stars are the photographs by Rick Pushinsky. I’d not met him before the project began but he’s a joy to work with, combining maximum talent and minimal ego to put people at their ease and get the very best images. I can only hope that reading the book inspires readers a fraction as much as the writing of it did. When people asked me what I was up to over the summer I’d say, rather blithely, ‘oh biking round nice bits of London meeting great people’. Writing can be such a lonely and insular job, that this felt like the opposite: meeting people of all ages and nationalities who share an enviable ability to think ‘I’m not going to get bogged down in what can go wrong, I’m just going to do it’. I’ve always mentally collected people who we should put forward as the finest examples of our species in the event of an alien invasion – those who are like normal humans but cleverer, more gracious, better looking, just more so in one way or another. Michelle Obama, Roger Federer, Zadie Smith, Tom Ford to name a few. Summer 2017 had too few of these uberhumans in the news, quite the opposite. But those I met for the startup book compensated. They are as a group talented, hardworking, glowing, outward looking and optimistic. They are, if you like, the anti-Trump. When I was young, there was an advert for Remington shavers in which the founder, Victor Kiam, would say ‘I liked the shaver so much, I bought the company’. I didn’t do that, but I have bought many of the products that the startups produce. Their founders spotted a gap in the market and filled it and on interviewing them, I always convinced. Cubitts, for example, makes beautiful, stylish glasses but for a fraction of the price that you’d expect to pay for them. My husband ended up buying four pairs when he went into the King’s Cross showroom. My kitchen has Ugly drinks, Pip & Nut nut butters, East London Liquor Company gin to name but a few. I just haven’t yet thought of a domestic use for the robotic arm made by Automata Technologies. It was wonderful too to be reminded of just how great London is. I regained some of the spirit of 2012 that had been crushed by 2016. It’s so easy to get stuck in certain well-worn paths of the city, rarely straying from your own area or the few streets where friends lived. But biking from Plumstead to Wanstead, from Kennington to Kensington, renewed my love. I’ve been cycling in the city for almost 30 years and it does get better and better. The Q2 quietway, how I love thee. There are 30 companies in the book – that’s 30 interviews to arrange, do, transcribe, write up, edit. It was a lot of work, more than I’d naively envisaged. But in the end I got a lot more from the experience than just the fee that I was paid.